Cuban President Raul Castro and Colombian President Juan Manuel Santos review troops during a welcome ceremony, Havana, Cuba, July 17, 2017 (AP photo by Ramon Espinosa). Colombian President Juan Manuel Santos traveled to Havana this month for a visit that regional outlets described as focused on economic cooperation. 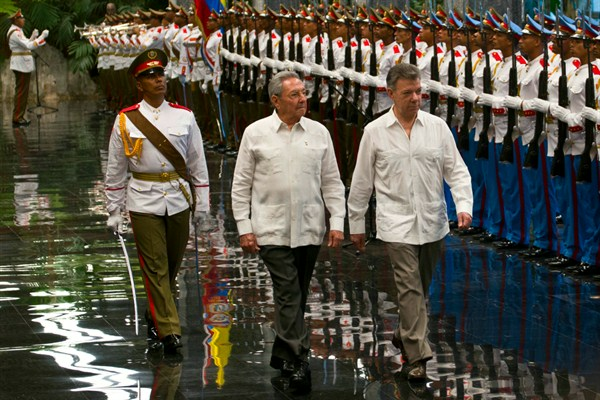 In addition, Santos again thanked Cuban President Raul Castro for having hosted the talks that led to a peace deal with the Revolutionary Armed Forces of Colombia (FARC). In an email interview, Adam Isacson, a senior associate for regional security policy at the Washington Office on Latin America, explains how the talks led to warmer ties between Bogota and Havana, and how this could pose trouble for U.S.-Colombia relations given the Trump administration’s Cuba policy.